The artwork represents a large, open book about nature and art. It marks the importance of remembering artists and offers an overview of different types of art. An excerpt of a poem by Gérald Godin, Cantos, appears on the cover page. It evokes memorable moments of city life and speaks of the passage of time. It also illustrates human beings' attachment for dogs. Two dogs appear in the work. A strip of color made of colored glass also pierces the pages of the book like a film or photographic negative. This refers to the colourful elements that arts bring to the city. Evokes some lovely moments of city life and speaks of the passage of time. It also illustrates human beings' attachment for dogs. The artwork evokes the colourful elements that arts bring to the city, while acknowledging the contribution of artists to the cultural richness of the city. The work was commissioned to commemorate the title of Cultural Capital of Canada that was given to the city of Trois-Rivières in 2009. 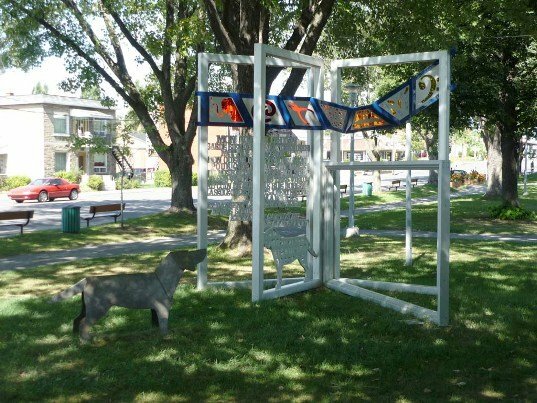 The sculpture is the first monumental work carried out under the Policy for public art at the city of Trois-Rivières.